Don't we need a president who likes to fire people? With mounting frustration over their inability to stop the slow and steady march of Mitt Romney to the Republican nomination he has sought for so long, the putatively conservative candidates have happened upon a most un-conservative weapon to use against him: class warfare. Mike Huckabee actually blazed this trail four years ago when he accurately pointed out that Romney “looks like the guy who laid you off.” There are, indeed, quite a lot of people around who feel that Romney laid them off; the Democratic party is gleefully squiring one of them around everywhere Romney goes to spread the bad word to eager reporters. In an election where the #1 issue will almost certainly be the desperate need for jobs, being painted as a job destroyer is a potentially fatal blow. Or is it? That depends entirely on what voters see Romney's job as being - at Bain Capital, and in the Oval Office. First, let's talk about what Mitt Romney's job actually was when he made a fortune at Bain Capital - that is, what venture capitalists and corporate raiders actually try to do. It's a sad fact that America is full of old companies with a storied and successful past but a rather dicey-looking present. Many of these companies, publicly-traded or privately-held, are led by executives who've worked there for many years. As a long-time employee, it's easy to get caught up in memories of what the company has been, even if the traditional business plan is simply not working anymore. This doesn't necessarily mean that all aspects of the company are doomed. Consider the famous example of Apple Computer, which ten years ago was a legendary but not terribly successful computer company. Today, thanks to the brilliant leadership of Steve Jobs, it's more of an entertainment company, making money hand over fist, and employing far more people than it did before. To reach this point, however, Apple Computer had to give up being Apple Computer; now it's just Apple, and far better for it. The purpose of private-equity takeovers and corporate raiders like Bain Capital is to find a company where a promising and potentially profitable business is trapped in the collapsing husk of former glories, take it over, and free the successful company from the husk. Does this always work? Of course not; that's why it's risky and only very rich people invest in having a go. When it works, though, it can be extremely profitable, and the gains are enough to make up for quite a few failures. The one common element to this perfectly legal and legitimate business strategy is that there are always job losses - and when you think about it, how could there not be? If the target company was successful and profitable already, covering the costs of the employees it already had, it wouldn't be a target for Bain Capital in the first place. What's more, by definition, at a company that's losing money, all the jobs are doomed unless something changes. Unlike the government, no company can borrow more money forever. Sooner or later it has to become profitable or the banks will pull the plug, the company will shut down, everything will be liquidated, and every last worker will be out on the street. Bain's goal was to get rid of the money-losing operations while preserving and growing the profitable ones. If you happened to have a job in the money-losing part, then yes, a pink slip was headed your way, with or without Mitt Romney or Bain Capital. If you were in the good part, on the other hand, then turning the company profitable saved your job. A profitable company is usually a growing company, which usually - surprise! - hires more people. That's why Mitt Romney can honestly claim to have created many jobs while his opponents claim, with equal accuracy, that he destroyed lots of jobs as well. suddenly Mitt's a lot more appealing. Entirely Rotten Government? Or Only Part? If there is one area where Mitt Romney's highly successful financial career proves his competence, it's at accurately identifying which operations - departments, divisions, business lines, products - are potentially useful and profitable and which are lost causes that should be shut down to stop the bleeding ASAP. That's what he did time after time, with more success than failure as his massive bank account demonstrates. Does that not precisely describe what the United States federal government desperately needs? For all that we complain about "our government," it's a fact that different departments aren't all the same. The Department of Defense, for example, wastes unfathomable amounts of money, but actually is pretty good at fighting wars, even ones for which our soldiers weren't thoroughly prepared and trained at the beginning. Efficient, no; effective, yes. On the other hand, the Environmental Protection Agency is spectacularly efficient, measured by its impact on the economy versus its comparatively small budget. Unfortunately, that impact is entirely negative: the EPA can whip out a regulation which, at the stroke of a pen, destroys entire industries. We can go right down the list of agencies and see where they lie. Some are both inefficient and ineffective, like the Department of Education which spends billions and teaches not one single child. Others work fairly well but could use some pruning, like the FBI. Still others are so utterly corrupt from top to bottom as to require a thoroughgoing cleaning out, as the National Labor Relations Board proves every day. The point is: if President Mitt Romney is viewed as an incoming CEO of a deeply troubled giant conglomerate, he may be exactly what we need. We talk about how our bureacuracy needs a chainsaw, and in sense it does - but what's really required is a very big and skillfully-wielded scalpel. Which accurately describes Mitt Romney's career at Bain Capital. So, is Scragged endorsing Mitt Romney for the Republican nomination? Not really; as we said before, we'll leave that to the primary voters. If the electorate and Romney himself clearly understand the President's constitutional role, though, we can see how he might make a good President, perhaps even being just the man for the times. There is a hazard. Thanks to constant indoctrination from the statist media, many Americans have gotten the impression that our President is supposed to be more like a king, able to solve all problems by fiat. Our Founders would be appalled by the thought; our federal government was intended to be strictly limited in power, breadth, and authority. Most of our current problems are caused by the past eighty years' departure from that foundation. The utterly false belief of the royal and omnipotent president is what Romney's opponents appeal to when they accuse him of being a job-destroyer. It is not the President's job to get you a job! It is the President's job to create an environment in which someone else may profitably offer you a job, which is quite different. It is, however, the President's job to run the executive branch. The President is not the CEO of the United States of America, but at least in some sense, he's supposed to be the CEO of the Federal bureaucracy and the ultimate boss of all the bureaucrats whose paycheck reads "United States Treasury." 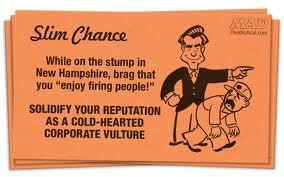 Looked at in that light, Romney should be applauded when he says "I like being able to fire people." As President, he can't fire you - but for darn sure he should fire a whole lot of useless bureaucrats! If there's one word that describes our federal government's most urgent requirement, it's "downsizing," and the various obstacles in the way need to be cleared out forthwith. We're not ready to join the Romney bandwagon quite yet. But we can see the possibility of a time when we'll say, three cheers for Chainsaw Mitt! Romney is a fence sitter so far in these primaries. He's trying not to lose. That is the reason that he has few passionate followers. He has to, needs to, get bold so he can capture the imagination of the American people. As I write this he is about as exciting as a plastic suit. obama will eat him alive when he brings up that Bain Capital stuff. It dies not matter that what he does was legal, created jobs, and saved many people their investments. obama will label him a the guy that laid people off because of his being a greedy republican. He will remind them that Romney will slash and cut jobs so the rich will prosper. It doesn't matter that what obama says is a lie, that is what he does, lie. If Romney doesn't come out with tax reform and stress it is for the little guy, come out with an energy policy that will get us off of foreign oil and start exporting energy, and spell out how he will shrink the federal bureaucracy, then he will lose. If this is not done soon he won't have to worry about beating obama, he won't win the Republican primaries.